I consider my work visual innovation. A hybrid of organic shapes and geometric arrangements, both made possible by paints. Each piece of creativity represents numerous possibilities design models of architectural natural peaks or mountains, bleeds of botanical fragments, floral growths, shadow of trees, unshakable stone structures and nature geometry. These organizations either stand on their own or compounded into visual fantasy of an undetermined landscapes. I often use memory as a process to discover new forms and ideas to incorporate flow and drips of paints into dramatic nature bestowed imagination. 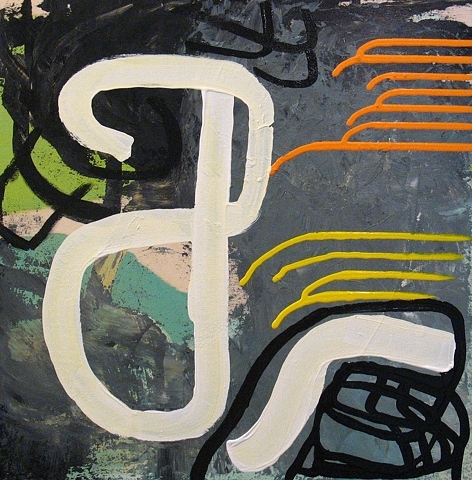 I am curious of how the process of painting and adhering could mimic series of occurrences by comparing actual happening of events in life as the paints begin to take form or dissolve into unpredictable results, and when subjects are adhered layers by layers can symbolize knowledge and experiences gathered. My intention was to restore and reinvent the innocence, the incorruptibility. It does not need to feel righteous, neither have to be naive nor ignorant. My latest work shows evidence of balance between sophistication and innocence. This range of my work place emphasis on feeling rather than interpretation, emotional reaction rather than trying to explain the meaning of something. Feeling as a result of visual impression given by the composition of drips or the sensation given by the multiple layers of acrylic enamel paints.